There’s an incredible amount of confusion when it comes to CBD dosage. One of the first things you want to know when learning how to use CBD oil is the actual dosage for your specific condition or ailment. The problem is that there isn’t a clear answer for CBD oil dosage. There isn’t one reliable CBD dosage chart out there that we’ve found (so we put together one of our own). Part of the problem is that each person reacts differently to CBD. There is also a difference in looking for the proper CBD dosage for pain, compared with the proper CBD oil dosage for anxiety. We’ve conducted vast amounts of research on the topic to try to bring sense to it all. We’ve looked at what the brands have told us, we’ve consulted with and read what CBD oil users were saying about their own dosage. Lastly, we’ve gleaned insights from our own use of CBD products. This is a good time to remind you that we are not medical professionals and none of this should be construed as medical advice. This is how we see it based on our own research and experience with CBD products. This is not a medical opinion and you should always seek advice from your doctor with regard to your specific health condition. 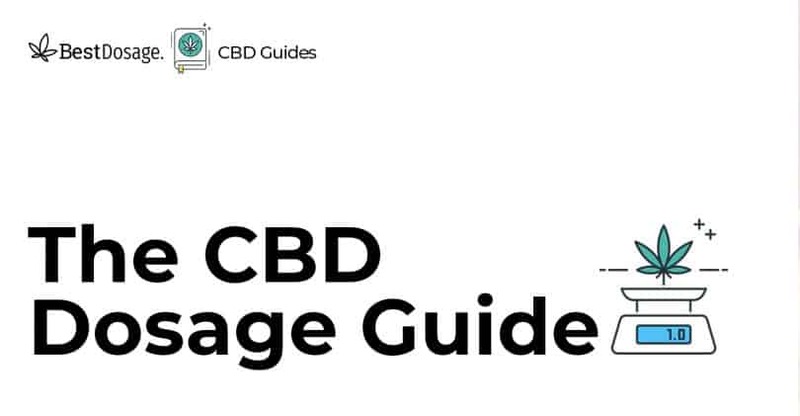 That being said, the hope is that this guide will send you in the right direction to make better decisions for your own CBD dosage. We’re going to start with some general information, then we’ll jump in further to specific ailments, and lastly we’ll get into proper CBD oil dosage for the different categories of products out there. We call these general guidelines for CBD dosage because they are just that. Remember, our bodies vary drastically in weight, diet, metabolism, genetics, and environment. Just like there isn’t a “one size fits all” diet, there also isn’t a “one size fits all” for CBD oil dosage. Part of integrating CBD into your lifestyle is coming to terms with the fact that there will be some trial and error while gauging your proper dosage. A universal dosage for CBD or any natural supplement isn’t realistic, so let’s get that out of the way from the beginning. A few things about this general CBD dosage chart, if you will. First, we can’t verify some of the more severe medical issues and their dosage. We just don’t know enough personally about CBD dosage for epilepsy or schizophrenia for instance. Also, some of the above seems a little low to us, like the General Health and Chronic Pain categories, while others seem a little high, like the Sleep Disorders recommendation. Keep in mind this is a very general guideline, even if it is backed with legitimate studies. One last thing before we move into more specific dosage suggestions. If you’re new to CBD, always use the “start low and go slow” method. The figures listed above, and the ones you’ll see in the rest of this guide, are the final destination. You should start with a relatively small amount of CBD at a consistent pace and ramp up slowly until you reach the point where you feel your treatment is working. Give it time! It could take days, weeks, or even months of patience and testing to see what works for your body and for your ailment. Micro-Dose. Taking a very low dose and increasing in small increments. MG Count. The number of milligrams (mg) in a particular product/dose. Vape/Vaping. The act of using a vaporizer to inhale CBD. Turning to CBD for help with inflammation is very common. Whether you work in a physically intensive profession, are an athlete, or simply suffer from inflammation of any kind, CBD might be the answer. CBD dosage for inflammation tends to be a little high than some other ailments, but don’t be scared off. You’ll find the sweet spot for your body’s needs in due time. Here is some information on how to use CBD oil to help with inflammation. CBD dosage for inflammation typically has a range from 50mg to 150mg. Starting with 20mg per day is common, often split into 2-3 doses throughout the day. It’s good to start with CBD oil drops, to begin with, in order to micro-dose, but most people end up taking capsules due to the high mg count. Often used to replace ibuprofen. While it doesn’t work for everybody, most do report that they found relief from inflammation after using CBD. For some, that happened within just a few days. For others, it took weeks or more to feel an effect and find the right CBD oil dosage. Some CBD products aimed at helping with this condition add turmeric to their formula, as it is a known natural inflammation reliever. One such product is the Receptra Active Lifestyle CBD oil line. It’s geared more toward athletes but is a great option for getting your CBD dosage for inflammation. Anxiety is yet another condition in which a growing number of people are turning to CBD for treatment. Whether yours is mild or severe, finding the right CBD oil dosage for anxiety will go a long way toward keeping it under control. This is one condition where a little goes a long way, yet almost everyone reports that CBD does indeed help. Here is some more information on how to use CBD oil to help with anxiety. As little as 5mg per day can help, but typical CBD oil dosage for anxiety is closer to the 20-25mg per day range. For more severe anxiety, 50-60mg per day is also common. It’s best to start very low, between 2-5mg per day, and split that up throughout the day. For more severe anxiety, it is not uncommon to use CBD oil or a capsule in the morning and then supplement it by vaping CBD intermittently during your day. Vaping is a very popular way of getting your CBD oil dosage for anxiety, as it has an almost instantaneous effect. In fact, those who vape CBD have reported that it can slow down or stop anxiety attacks pretty much right after taking a few puffs. Often used to replace Xanax or similar medication. The number of people who are diagnosed with anxiety (or self-diagnosed) has simply skyrocketed in recent years. There are 40 million adults in America suffering from anxiety, which is an astonishing number. Although only 36.9% of them receive treatment, that’s still money in the bank for pharmaceutical companies. At least it has been until CBD came along. Treating anxiety with CBD might be the fasting growing segment of the entire CBD industry. We know vaping works great for it, as vapor has no smell and generally tastes better than CBD oil itself. Select CBD is a brand that seems to target anxiety sufferers specifically, producing a disposable CBD vape pen called Relax. However you decide to get your CBD oil dosage for anxiety, chances are it will make an impact. This one is probably the trickiest. For one, pain is a relative thing. One person’s pain tolerance is not another’s. So while a certain dosage could work well for you, it might be woefully inept for your neighbor. That being said, there are some generally known facts about CBD dosage for pain which might help. There are a lot of people using CBD for different conditions that are causing them pain, such as fibromyalgia and others. Here is some more information on how to use CBD oil to help with pain relief. CBD dosage for pain varies widely. For some, as low as 20mg per day might be enough. For others, 200mg per day is what they absolutely need. CBD has been known to “untighten” muscles which have been locked in place for years. In addition to physical pain relief, CBD has generally been known to reduce fears and anxiety, which itself goes a long way toward pain relief. Getting the right CBD dosage for pain is harder than for some of the other ailments CBD is used for. If you live in a state where THC is legal, then consider a product that has a combination of CBD and THC as that might work better for your needs. Nonetheless, CBD alone can be a gamechanger for those looking to get off of pain medication or at least reduce their reliance on them. If you have chronic pain of some type, it’s worth trying a few different brands to understand what works best for your body. We’ve heard people raving about the brand Hemplucid, in particular, for being able to reduce pain. If they don’t work for you, don’t give up. Remember that finding the right brand and the ideal CBD dosage for pain is a journey, but the payoff is huge. Finding relief for rheumatoid arthritis can closely match the journey to finding relief for inflammation. While there is some crossover, the CBD dosage for rheumatoid arthritis isn’t exactly the same. You can experience inflammation as a temporary side effect of physical labor, but rheumatoid arthritis can flare up for no reason at all. What we see is that more and more people are turning to CBD as a possible answer for relieving their suffering. Here is some more information on how to use CBD oil to help with rheumatoid arthritis. A combination of a CBD tincture and a CBD topical is very common. CBD dosage for rheumatoid arthritis is harder to gauge because of that. Generally, the range will be from 20mg to 120mg a day, plus more CBD transmitted transdermally via a salve or cream. Starting with just a few drops of CBD oil taken sublingually under the tongue is a good way to go, and up your dosage accordingly. Massing a CBD salve or cream into your skin where you have joint pain can go a long way. Often used to replace Advil. While there is quite a bit of redundancy here with inflammation, there is a big difference in that the CBD dosage for rheumatoid arthritis almost demands a topical. Inflammation can be helped with a topical too, but for this category, you really should make it part of your routine. There are some wonderful CBD salves out there, and we particularly like the Endoca hemp salve for its high CBD content. Test out the different combinations of oils, tinctures, and CBD topicals until you find what works best for you personally. While the above conditions are the most common ones being treated by CBD, there are a great deal of others. We won’t get into the CBD oil dosage for cancer, because we don’t know enough about it and we refrain from being speculative. The same goes for the CBD oil dosage for autism, although there was a recent study that saw incredibly promising results (https://www.leafly.com/news/health/research-cbd-autism-therapy-promising-results). Yet there are a few other categories that we can lump in together here and give you some quick takes on. With that being said, here is some information on how to use CBD oil to help depression, ADHD, and your dog. The correct CBD dosage for depression closely relates to the one for anxiety. Typically you can start with as low as 5-10mg of CBD per day, and after a while if there is no effect you can microdose up to get to where a real difference is felt. It does seem that full spectrum CBD products do a lot better with depression when compared with isolate only products. While you should never drop your current medication without advice from your doctor or mental health professional, we know that many people have been using CBD to move away from the SSRI class of drugs. We get a lot of parents asking what the proper CBD dosage for ADHD might be for their children. We’re very cautious about this, especially when dealing with a minor. Here we’re only going to address adults that are looking to perhaps replace or supplement medications such as Adderall or Ritalin with CBD. Generally a little goes a long way with ADHD, and we’ve heard of 10mg, or even 5mg, being enough. However, it isn’t unusual for a CBD dosage for ADHD to be closer to the 20-25mg range either. You can microdose here until you start to regain the focus you were looking for in your day to day. Yes, even our furry friends can make use of CBD. There actually is a growing chorus of pet owners who have eschewed traditional medication for anxiety and pain, and order CBD instead. CBD dosage for dogs is highly dependent on how big the dog is, so always keep that in mind before giving yours any. We like that CBDfx makes a range of strengths, for small, medium, and large breeds. As per their recommendations, CBD dosage for dogs should be 1mg of CBD for every 4lbs of your dog’s body weight. After outlining the proper CBD dosage for each ailment above, we’re going to move on to breaking it down by consumption method. The way you choose to take CBD also plays a role in understanding the proper CBD oil dosage for your needs. First, you’re going to need to know a little about CBD bioavailability. This is a topic that can get kind of complicated, but we’re going to keep it rather simple for you and focus on pragmatic results. To understand CBD bioavailability you need to know that every milligram of CBD you put into your body needs to at some point get to your bloodstream to have an effect. The way it gets there and what your body needs to do to deliver it there will have an impact on its effect and duration. For instance, taking CBD oil drops sublingually (by placing them under your tongue) brings them in more direct contact with your bloodstream. This increases the CBD bioavailability, which is to mean the percentage of CBD that actually gets through to your body. Studies have shown that consuming in this way gives you a CBD bioavailability of somewhere between 12% and 35%. Compare this to the CBD bioavailability of consuming an edible, such as a CBD gummy, which has a CBD bioavailability of around 6%. Sounds rather clear-cut, right? Just take the kind that gets more CBD into your bloodstream. Actually, it isn’t that simple. There are other considerations to be made. One of which is the fact that different ways of consuming CBD will affect: 1. How quickly your body starts to feel the effects of the CBD, and 2. How long your CBD dosage will actually last. Although CBD edibles may seem like a waste to some, other people appreciate how long CBD actually stays in their body. Another consideration is ease of use. Sometimes it’s a lot easier to grab an edible, or your CBD vape pen, and go out for the day rather than take a bottle of CBD oil and find a comfortable place to take your CBD oil dosage the proper way. There’s a lot of talk about CBD bioavailability and there are people who will rail against one method or another for that reason, especially on Reddit. Yet, what matters, in the end, is how CBD fits into your lifestyle and how it might make you feel better. So, sure, CBD availability does matter, but not nearly to the extent that some might make you think. Always choose what works for you and your body, remembering everyone is different. Now let’s get into some common questions we get with regard to CBD oil dosage via the different methods of consumption. How Many Drops of CBD Oil Should I Take? For a lot of people, their first entry into CBD will be through oil. Taking CBD oil sublingually by placing drops under your tongue for at least 30 seconds (longer if you can hold it), is often cited as the most effective ways to dose. Yet, they also come to us asking how many drops of CBD oil should I take? To understand the proper CBD oil dosage for you, you’ll first need to know how much CBD is in each drop. This will vary between brand and also the strength level you choose. One example is the CBD oil dosage for NuLeaf Naturals. They list a serving size for their 725mg bottle of full spectrum CBD oil as a ½ dropper or 10-12 drops. As each drop is 2.4mg of CBD, that would work out to 24-29mg of CBD. If you’re new to CBD and depending on what you are treating, this could be entirely too much. We always recommend starting with just a few drops and then moving up after a few days or a week. Your body needs time to adjust to the CBD itself, and it’ll be some trial and error until you find the proper CBD dosage for your needs. The good thing about CBD oil is that you can go up or down with single drops, which is the best way to microdose. With regard to CBD bioavailability, taking CBD oil sublingually typically takes between 15 minutes and an hour to feel. You should feel the effects for a nice amount of time, somewhere between 4 and 6 hours is normal. One big advantage that vaping has over other methods is the almost immediate effect. While the CBD availability of vaping is really high, it also went away faster. A few hours is probably the most you’ll get out of vaping CBD. Since you’ll be dosing more often, it makes it even more important to answer how much CBD should I vape question. Like strength levels with CBD oil, determining the proper CBD dosage for your vape pen will also depend on how many mg of CBD is in it. The nice thing about vaping when compared to other methods is that you really can just play it by ear a bit. Since vaping CBD hits your bloodstream basically instantly, you can just take a few puffs, see how you feel, and take more as needed. Higher mg options like the Select CBD 250mg vape pen will require less vaping as you’ll get more with each puff, but there also isn’t ever really concern about your CBD dosage being too high with vapor. You’ll know based on how you feel, so don’t be too concerned with having an exact answer to how much CBD should I vape. If you want to read up further on vaping CBD, be sure to check out our Guide to CBD Oil Vape Pens and CBD Oil Vape Juice. How Many CBD Edibles Should I Eat? Really, the question shouldn’t be how many edibles should I eat, but how many milligrams (mg) of CBD you should ingest. Often we see the question posed this way, so it’s a good opportunity to make that distinction. How many CBD gummies you should take isn’t a valid question if you don’t know how many mg of CBD are in each gummy. Makes sense, right? Your CBD dosage of edibles is going to highly rely on the condition you are trying to alleviate. Unlike oil or vapor, this is a really straightforward dosing proposition since there will likely be a set amount of CBD for each product you eat. The CBD bioavailability of edibles is on the low end of the spectrum. For one thing, that means it’ll take a lot longer to feel the effects. It could easily take an hour, sometimes even two or more. It’s important to start low and work your way up slowly. That’s the rule for CBD in general, but even more so with edibles. On the plus side, users report that edibles last them a great deal longer. They can stay in your system as long as 9 hours, with 6-8 hours being typical. For those who don’t want to have to deal with dosing throughout the day, higher mg edibles like the 25mg Hemplucid CBD gummies are a great option. How Much CBD Topical is Enough? If you’re using a CBD topical, chances are it’s either for pain, inflammation or a skin ailment of some sort. As a stand-alone, a CBD topical can work wonders if you’re dealing with a chronic skin problem that isn’t taking to treatment, or if you simply want to find a more organic solution. CBD dosage for a topical is more or less just trying to put a little on the affected area and see how it reacts. Usually, you’ll know within a few days or a week if it doing the job since the CBD bioavailability through your skin is really high. If it doesn’t work, try dosing more throughout the day or use a different brand. If you’re dealing with localized pain or inflammation, often a combination of a quality CBD capsule along with a CBD topical will work wonders. Expect the CBD capsule to take about an hour to fully get into your bloodstream, and then go ahead and add the topical. We like the 25mg CBDPure Softgels as they go down easy without any aftertaste, and they back up their products with a 90-day money-back guarantee. We just threw a whole lot of information at you, but we did it in the hope that it would answer a lot of the questions you probably had about CBD dosage. There are a few things we want to make sure to leave you with that are important to keep in mind. First, one thing we didn’t completely address is the full spectrum versus CBD isolate debate. To make a very long story short, full spectrum has been shown to be more effective for most people due to the entourage effect. That’s when many different cannabinoids work together and the final effect is more than the sum of their parts. Typically there will be trace amounts of THC in full spectrum products, although not always. Being worried about failing a drug test is a common reason people give for choosing a pure CBD isolate product, which only has CBD, over something full spectrum. Yet, sometimes CBD isolates just works better for certain people. We’ve encountered those who were dealing with severe pain and insisted that a CBD dosage that is free of anything else, in isolate form, worked far better. It’s hard to argue with a first-hand account like that, despite the studies that say the opposite. Which leads us directly into our last point. Even with all the suggestions we’ve given you based on our own research and experience (again, these are not to be misconstrued as medical opinions and we make no such claim), every single person is different. Whether it be the right CBD dosage, the right product category because of CBD bioavailability, or simply the right brand, all of it plays a role. CBD seems to be incredibly fickle, and one person’s panacea will be another person’s “bogus product.” If you’re determined to find a solution for what ails you through CBD, you’ll need to have some patience and deal with a little, or a lot, of trial and error. Along the way, we’ll be here to help you in any way we can. Feel free to comment below with your feedback or any questions you might have. It’s been a pleasure taking you on a CBD dosage journey, thanks for coming along for the ride and here’s to making your own personal CBD success story a reality! I would like to know what companies that are reputable today? I am a lung cancer patient right now . Chemo and radiation but want to use CBD oils. Which one would be recommended? I’m trying to figure what’s best for dosage if chronic pain is the primary issue. Spinal stenosis, arthritis and after effects of chemo and radiation on joints. Hydro-cordone has been a daily part of life. Looking to find an alternative but am uneasy about THC and don’t want to go that route. What do you suggest? Thanks in advance. – CBD dosage for pain varies widely. For some, as low as 20mg per day might be enough. For others, 200mg per day is what they absolutely need. – It’s still best to start low and slow. Depending on how much you have and what kind, starting out somewhere between 10-20mg per day is normal, and you can quickly move higher if you don’t see results. Hope that helps and best of luck on your CBD journey! I have a bottle of HEMPWORX 750. I cannot come up with the dosage I should take. I have chronic painful illness, anxiety, sometimes cannot sleep and etc. How many drops should I take at one time and how many times a day should I take it. Unfortunately we can’t help you with info about Hempworx. It’s not a brand we list and we don’t plan to. We’ll dive into why that is in a future post. You should reach out to whomever you purchased from to help. Best of luck! We’re a bit unsure of your question. Are you asking about cod oil or CBD oil? What type of ailment are you trying to treat? Great article very informative. And a great website, good job!